Since I decided I’m not in any hurry to move (unless #2 comes along, which hopefully won’t happen for a few years), I am slowly re-decorating and organizing our apartment. I love where we live. We have so much natural light, fabulous storage (aka an attached garage), great layout and awesome location. I figure I could work on organizing our space a little better. We have so much wall space going up the stairs from our entrance, I decided it needed to be used (especially since losing a closet to Penelope). I was inspired by How About Orange‘s faux boix project and thought how well it would translate to decorating wall hooks. 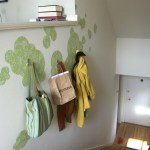 Here’s how I did it: I bought decorative contact paper from Target ($5) and drew a bunch of circles and cut them out. I located the wall studs, made marks and arranged my cloud forms accordingly. Then, I located the stud (again) and screwed the hooks in. I think from start to finish the whole thing took me less than an hour. Pretty sweet hu? I’m mostly excited to do something to our embarassingly plain walls. Now that it’s finished, I think I’m going to buy more hooks and do it to the entire wall. Melissa! you amaze me with all of your crafty ideas. It looks great! You have such great decorating ideas! I love looking up your blog and just feeling inspired to jazz life up a little with.